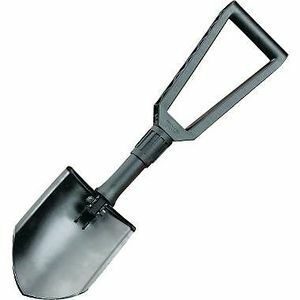 An entrenching tool, often called an "E-Tool," is a specialized shovel originally designed for "digging in" or entrenching. Some e-tools will have either a saw in the handle or serration on one or more edge of the shovel. Various metals used include aluminum, steel and titanium. Many shovel either fold, tri-fold, or telescope to make them more compact packing and transport. Folding can make the shovel less sturdy, but tri-fold are the smallest once folded and the folding heads can often lock into different positions to improvise tools such as a hoe. This page was last modified on 25 March 2014, at 16:30.